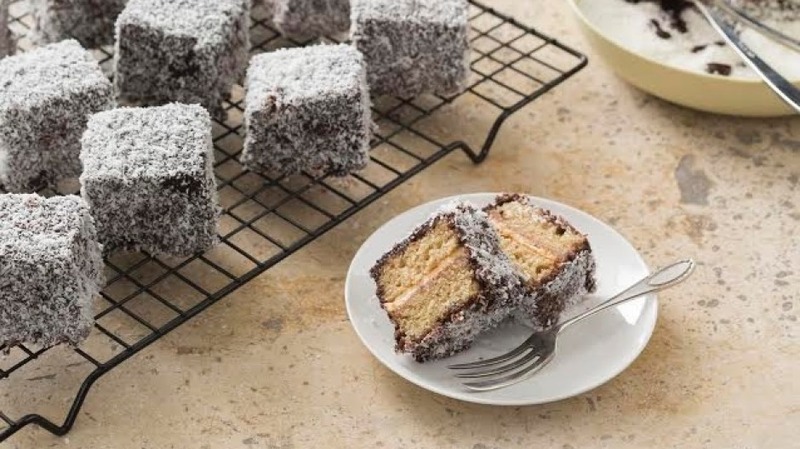 Here's another way in which you can use your thermomix to make something more than a soup, like these gluten-free lamingtons which go down a treat. 1. Preheat oven to 180°C. Grease a cake tin (20 x 30 cm) and line base with baking paper. Set aside. 2. Place milk, butter, flour mix, sugar, baking powder, eggs and vanilla into mixing bowl and mix 10 sec/speed 4. 3. Scrape down sides of mixing bowl with spatula and mix for a further 10 sec/speed 4. Transfer mixture into prepared cake tin and spread evenly with aid of spatula. Lightly tap tin on benchtop to remove any excess air bubbles. 4. Bake for 15 minutes, or until a wooden skewer inserted into the centre of the cake comes out clean. Allow cake to cool in tin for 5 minutes, then turn out onto a wire rack to cool completely (approx. 20 minutes). 1. Place all chocolate icing ingredients into mixing bowl and mix 10 sec/speed 6 or until smooth. 2. Scrape down sides of mixing bowl with spatula and mix 3 sec/speed 4. 3. Transfer icing into a bowl and set aside. 1. Insert butterfly whisk. Place cream into mixing bowl and whip until soft peaks form/speed 3.5, watching carefully through hole in mixing bowl lid to avoid overwhipping. Remove butterfly whisk. 2. Trim edges of cooled cake, then cut into halves. Spread one half of the cake with all of the jam and top with all of the whipped cream. Stack remaining cake half on top of cream. Transfer into refrigerator to chill for 20 minutes, or until the cream is firm enough to cut the cake into squares. 3. Using a serrated knife, cut the layered cake into 12 portions (approx. 4.5 x 4.5cm). Using a palette knife, run knife around the cut surface of each lamington to remove any excess cream. 4. Spread coconut onto a plate. Carefully rest a cake portion on a fork, and using another fork dip cake into the chocolate icing, spooning icing over the top and sides to completely coat cake. Allow any excess chocolate to drip off. Carefully transfer cake onto plate with coconut and roll in coconut to coat all sides evenly. Transfer onto a wire rack. Repeat icing and coating with remaining lamingtons. Serve or transfer into a sealable container until ready to serve (see Tips). · Jam can be replaced with marmalade. To make your own marmalade or jam, please refer to the recipes in The Basic Cookbook or Everyday Cookbook. · Lamingtons can be stored in the refrigerator for up to 4 days. Bring to room temperature (minimum of 30 minutes) before serving. This recipe is an extract from the Good food, gluten free Thermomix cookbook.